The REMI Ultra Low Temperature Freezers are specially designed for rapid pull down of temperature & optimized cryopreservation. These chambers are ideal for long term storage & meet all critical requirements. Efficient insulation with high core density reduces temperature loss. Independent foam insulated Double doors for reduced temperature loss. Smart handle with door open LED indicator. 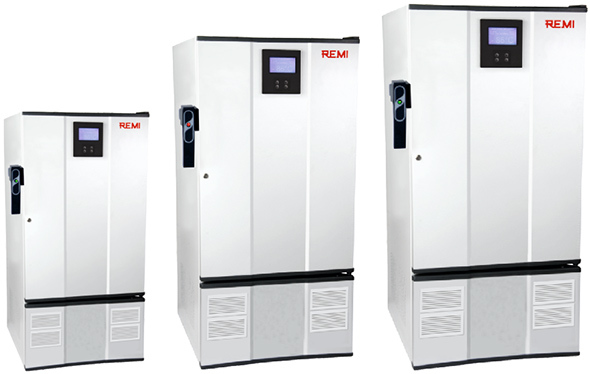 Optimized compressor run ensures energy efficiency. Eco friendly CFC free refrigeration system provides reliable conditions. CFC refrigerant reduces carbon footprint. Audio-Visual alarm for temperature variations. Intelligent controller with clever chip provides crucial backup to maintain temperature in event of controller failure. Microprocessor controller ensures precise temperature management at – 86°C. Temperature range - 45 °C to -86 °C (in A/c room). Suitable for long term bio sample storages according to GMP / GLP practice. Double foamed doors Inner & outer reduces temperature loss. Temperature variations indicated by audio visual alarms. GSM Mobile SMS Alert for variations.